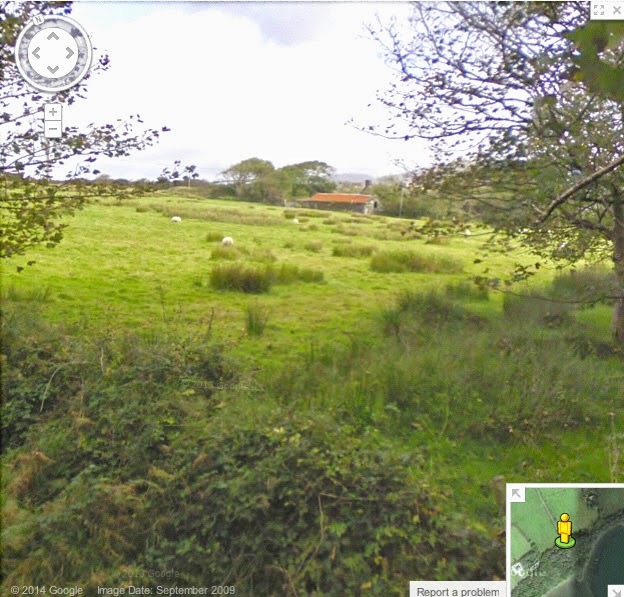 Virtual Paintout - County Kerry, Ireland! This was my 27th time participating in the Virtual Painout and I wish I had started sooner. Looking at the list of locations I missed, there were some interesting places. 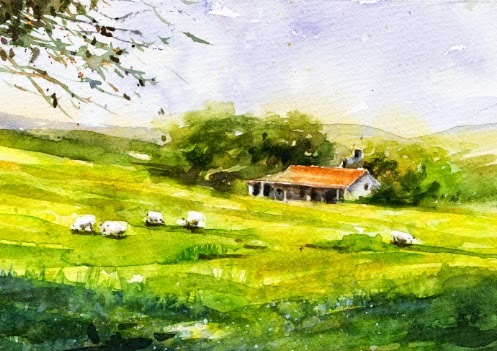 County Kerry, Ireland was the location chosen by Bill Guffey for the Virtual Paintout, October 2014. Artists use Google Street View to look around the designated area and choose their subjects to paint. We submit our pieces to Bill and he posts them on his blog and on Facebook. 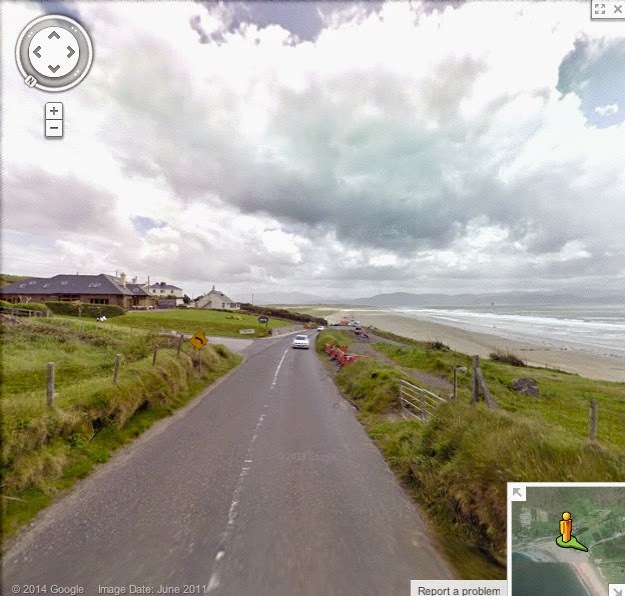 I had fun looking around this part of Ireland. I wanted to find a view with some sheep and I did. Looking forward to next month's location! Our recent paint-out location at St. Luke's Hospital in Pasadena was interesting, as always! The old hospital is closed now and is a popular location for movie and TV filming. When we met there some months ago I painted two pieces and didn't quite finish either one. I thought I might bring them both to finish. It's lucky I didn't. Where I sat last time, at a medical building across from the hospital, workers were doing some major tree trimming. I wouldn't have been able to work on the paintings at all. As it turned out, we all painted from the hospital area, looking toward the mountains. In the morning, some cloud shadows on the mountains made them a dramatic backdrop for the yellow apartment building which was in the light. The medical building in front was in shadow and I liked the way the yellow looked so bright. Still needing to finish those two paintings! We had such a fun and unusual paint-out today! Something different...Halloween is coming soon. We met in an Altadena neighborhood noted for its Halloween decorations where one house was the main attraction. It was a bit of a puzzle for me, trying to chose what to paint. 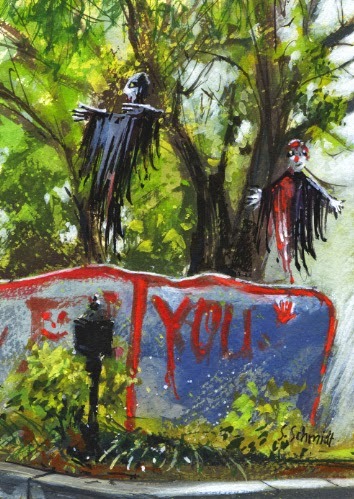 I finally settled on a spot in the shade where I could see some interesting backlit zombies hanging from the beautiful sycamore trees behind a hand-painted metal fence. The Haunted Yard opens for a few hours on October 31 and is free for brave visitors. The highlight of our morning was a tour behind the fence given by the owner! Wow. He loves Halloween and since September he has spent a lot of time and money working on his annual showpiece. It's so impressive that the thousands of people who come result in the street being closed on Halloween. I think for me to see it during the daytime was scary enough. This Haunting experience goes way beyond Jack-O-Lanterns! I painted at Union Station in downtown Los Angeles in July and was looking forward to my next visit for plein air painting. I posted that gouache piece of the tile fountain in Union Station Fountain. Last Friday one of the groups met there to paint. The courtyard with the fountain wasn't at its best this time. The fountain was being repaired so it was fenced off. We all headed to the south courtyard. It's usually been too hot there and not enough shade. But in October the sun was to the south and the trees provided some nice shade. 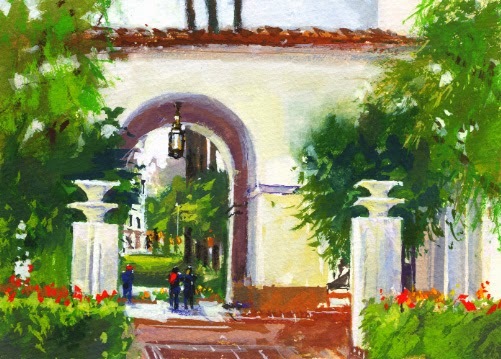 I used gouache again and tried to suggest the distinctive patio light fixtures and the arched entrance. This was another busy paint-out location and we had lots of questions from onlookers. The first time I painted Union Station, it was a watercolor from the park across the street, and was over two years ago...Union Station. I would do this differently now. Kind of interesting to look back to an early plein air piece. A week ago I was able to paint in Chinatown again. 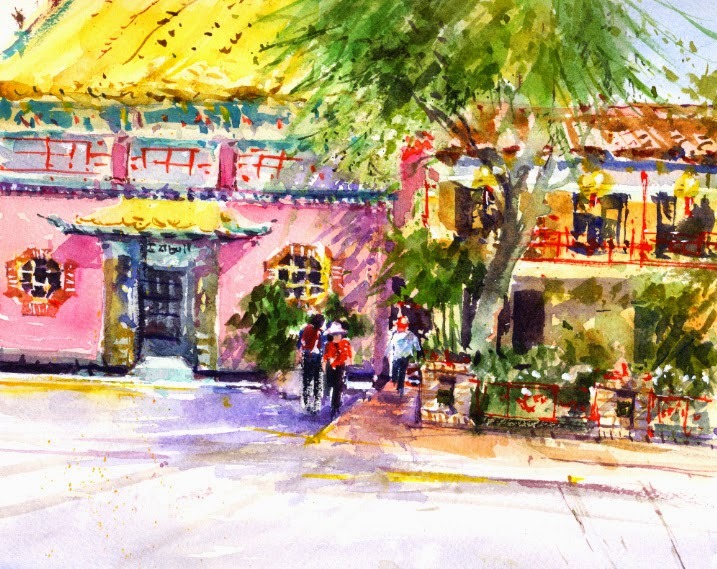 It's been over a year since I painted there and posted that watercolor in Chinatown!. Such a fun place to visit and an exciting paint-out location. Unfortunately there usually seem to be changes that aren't always for the best. I was shocked to see a favorite and colorful shop was closed for good. I used "Busy" in the title of this post because of its multiple meanings. Not only is our downtown Chinatown busy with people - regulars, painters, and tourists - but it also showcases some very busy architecture. In the 1930s the central plaza was developed to look like Shanghai by Hollywood film set designers. They did a great Hollywoodized version, complete with dragon roofs and lots of neon. For me, it's always been a special place to visit. I had an enjoyable morning painting this watercolor. Love the ornate pink building with a yellow tile roof. And I had many observers stopping by to ask what I was doing. 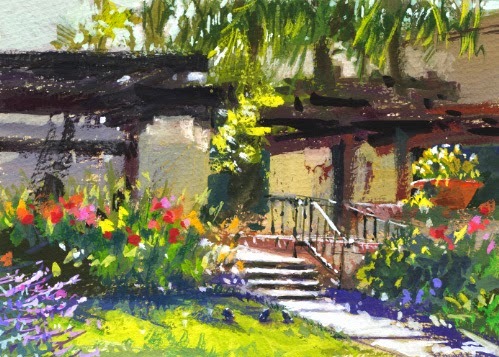 Yesterday the plein air group returned to paint at the Los Angeles River Center and Gardens. The property used to be the well-loved Lawry's California Center. A year ago, on my first visit to the renewed location I painted two pieces which I posted in Lawrys!. I see that exclamation point on the title! The gardens are just so beautiful there that it continues to be a surprise on each visit. And it also brings back memories of when we visited years ago and enjoyed the lovely outdoor cafes. Now it's a very popular location for weddings and special events. In the morning we painters were almost the only people at this gorgeous place. When we left, there was a "Closed" sign on the gates for an afternoon wedding. A photo below is of the entrance gates from the inside. I painted a gouache piece since I haven't painted one for quite awhile. Looking through my pile of paintings, I see I've been there twice since my first visit but haven't posted those watercolors yet. Maybe my next post. A couple Saturdays ago we painted at the South Pasadena Library. The old library building at this location is from the 1930s and was the entrance when I moved to South Pasadena. It was expanded in the 1980s, including a new entrance on the opposite side of the original building. This is the view most of our group was painting so I chose a shady spot in the same area. The last time I painted at the library I tried the coffee house across the street which I posted in Kaldi. 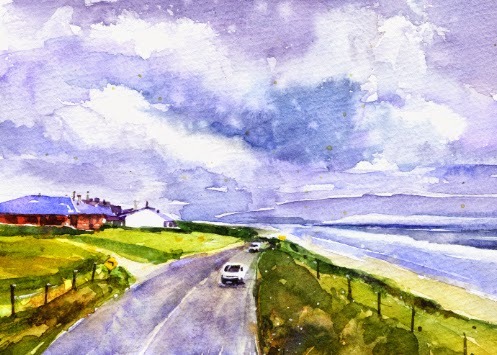 After my two recent watercolor workshops with Iain Stewart and David Taylor, I'm thinking about what I've learned. There is so much to understand about watercolor. After understanding the basics, it's another thing to master...beginning plans and finishing details with a goal in mind. With all that's in our painter's brains about what to do, maybe we just all paint intuitively...it's on my mind. 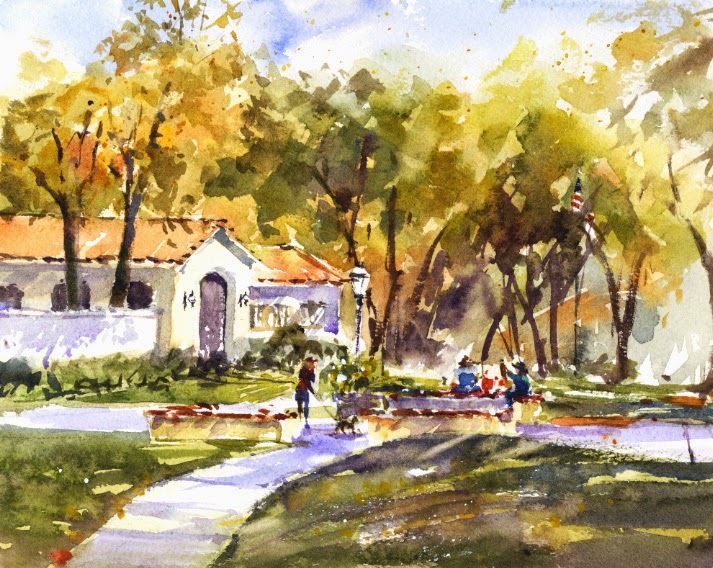 One of the plein air groups was back at the Los Angeles County Arboretum for our quarterly planning meeting. We plan our next three month's of painting locations. That leaves us with a shorter time to paint so we all chose views close to the Peacock Cafe where we meet back to show our paintings. The last time I painted at the Arboretum was in June and I tried a gouache piece that I posted in Meditation Garden. 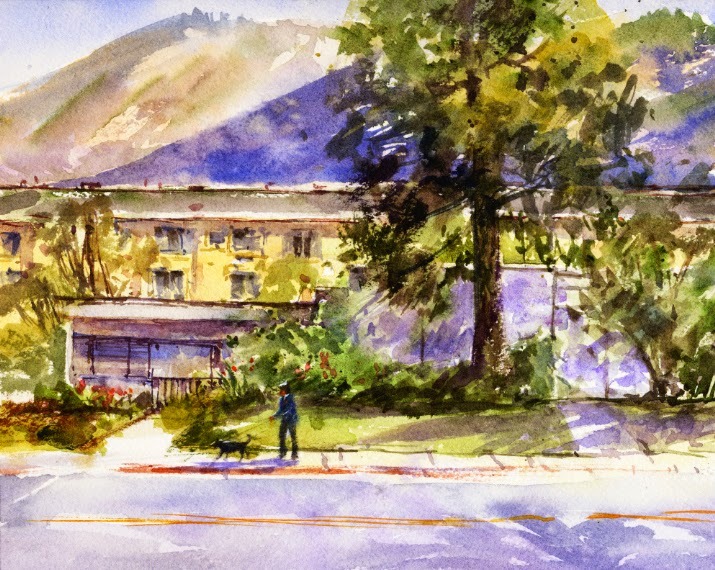 On this visit I painted a watercolor of the view just a few yards from the cafe, looking north to the mountains. The cafe looked festive with its white umbrellas, white lights, and white paper lanterns. And the colorful, pink silk floss trees were blooming so I was happy to be able to include some of them. 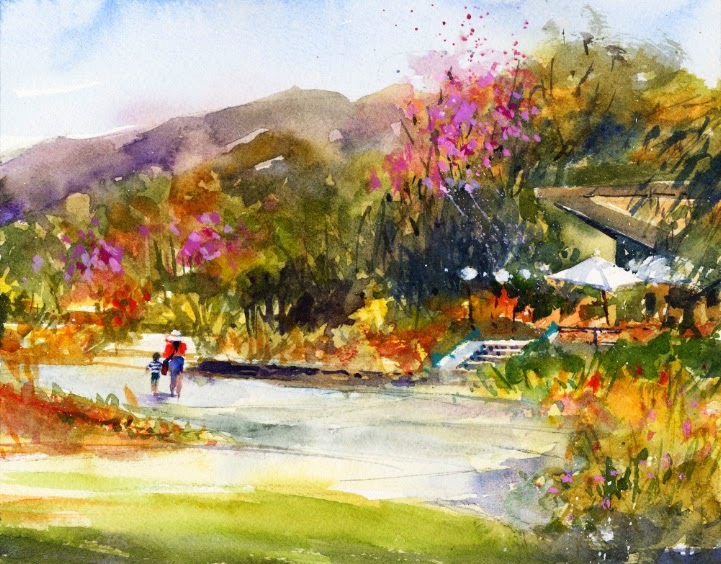 There is always a lot to paint at the Arboretum. Maybe a greenhouse next time.